This large, hand-painted ceramic mural integrates architecture and history. Mythical animals, including peacocks and the historic bull and bear of the stock exchange, are incorporated into a large illuminated “D” for Detroit. The wall is alive with intricate Byzantine and Aztec designs influenced by murals in the Fisher Building, the Guardian Building and Diego Rivera Court in the Detroit Institute of Arts. Joyce Kozloff is an internationally known artist who is sought after by many public art projects. She made and hand painted all of these tiles in Kohler (pronounced Coal-her), Wisconsin at the Kohler Art Center. The room where she worked was so small that she never got to see this piece altogether until it was installed. 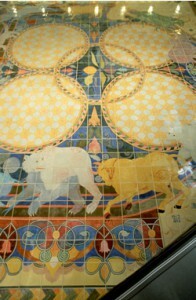 The bulls and the bears symbolize the stock exchange. If you follow the bulls and bears around, you can see that they form a large letter “D” which stands for Detroit. A Detroit family by the name of Freer had a room which had peacocks painted on the wall. These peacocks were actually painted by the famous artist, Whistler, who had painted them for a home in England. The freer family purchased the walls of the Peacock Room and had them installed in their home in Detroit. The peacocks you see in this piece pay tribute to Whistler’s peacocks. That wall is now located in the Smithsonian in Washington, D.C.